Over the past month I've had the pleasure of spending time with four of my "competitors." Within my first conversation with each of them, we mutually realized that we are more about co-opetition than competition. In fact, we bring value to each other. We each have two obvious things in common: We are bloggers and we are lead gen practitioners. Don't fall victim to competitive relationships turning libelous and disrespectful. Frankly, when I hear prospects and clients share these negative stories, I ask them why they think others have to resort to sales tactics such as those? Can't they sell on their own merits? Don't sell with negative competitive messaging; it doesn't suit you. Co-opetition is by far the best way to manage your competitive relationships. You can all maintain a more professional presence in the market, and long-term you will all benefit. I'll continue retweeting and cross-posting these four gentlemen while keeping my eyes open for opportunities to work with them. They are all top-shelf. 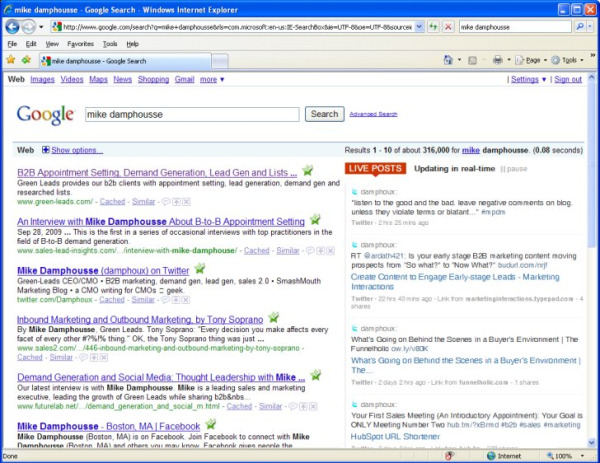 Competitors are definitely worthy of being part of the Lead Gen Tips collection. Already this month a lead has come of it. Do you compete or do you co-op? MikeBarzacchini: "Viral video (and social media) is like ROI: both can only be determined after the fact." jaybaer: RT @jaygleaton: Assume whoever gets to your blog is there accidentally so make it clear what you do on the top of the page. DavidBThomas: B2B or B2C, the Bs are all people. Give them content that's useful to them in the ways they want to get it. 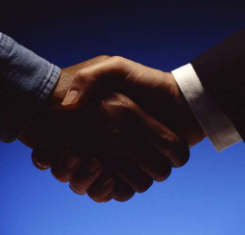 Which of the following is a good sales outcome for introductory appointments? 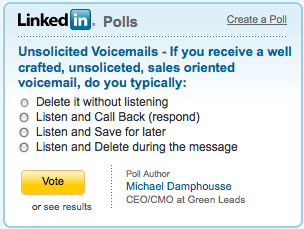 I know a ton of salespeople that would put the first outcome in the success category. You got a pipeline opportunity, right? A proposal? WRONG! You got a brushoff, a more sophisticated variation of saying "send me a datasheet." He was just letting you down easy. What he really said was, "Here's enough hope to keep you busy for a week or two and then you can go away." You may have pitched them, but did they hear anything? Was any of it relevant or bring value to them? The second scenario is far more successful. The next stage in the sales cycle has started. She shared her real issues with you. You shared some value. She wants to continue the conversation. That's how prospects buy today. It's all about the second meeting. Whenever I get a new lead from a prospective company, I always check its web site to see if it looks like a good fit. A good deal of the time I'm unimpressed with what I see. The home pages are cluttered, not structured for a quick read, and no actions are suggested. Isn't a home page the ultimate landing page? Granted, you don't want the home page hiding all the navigation and consisting of a form, but take landing page best practices and use what makes sense. Make the goal of your own Home Page "Landing Page" to convert the single-page visit to a multiple-page visit. We all put a great deal of effort into landing pages. Studies show how people read a web page and what triggers response. Last week at the MarketingSherpa summit in Boston, for example, we heard that "people read a landing page like the letter "F:" Top scan, down the main body, scan right, take action (if triggered). Here are two great examples. 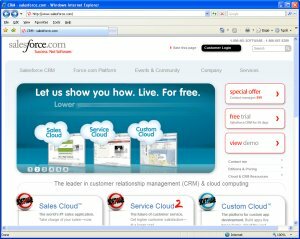 The first is Salesforce, which I've always criticized because of the big, animated ad in the middle, but then I changed my mind. The ad gives you a quick message -- six messages in fact. Then it's surrounded by calls to action and the flow leads you to a next step. But the animation is not SEO-friendly, you ask? No it isn't, but does Salesforce need its home page SEO optimized? Most likely they rank OK as it is. The second is Hubspot, the inbound marketing gurus. The home page reads just like a landing page with call to actions and a next-step arrow to learn more (upper right). Both are easy on the eyes. The design is clean and uncluttered, with a clear call to action on the righthand side. Is your home page designed to convert? What about Green Leads new Home Page? Comments? We had a prospect ask this past month to give her 10 reasons to work with Green Leads. It was an interesting request, but we took it on with a twist. We delivered not 10 reasons, but 15 thoughts to ponder. Thought I'd share it. View more presentations from Michael Damphousse. Unified Demand GenSM - noun (yōō'nə-fī'd·di-mand·jen): 1. 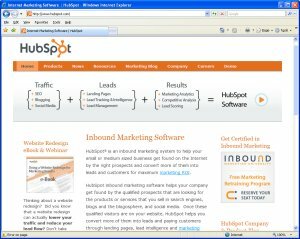 The efficient use of inbound marketing and outbound marketing techniques to maximize lead generation. 2. Essential b2b lead generation best practices. Inbound Mafia, Outbound Mafia...we're all one family. How many analysts do I have to work with to get it to be a buzzword? More later. There were days in my lead gen life where I could have easily left for lunch and not come back for four hours. MIT data shows that that might have been a good idea! 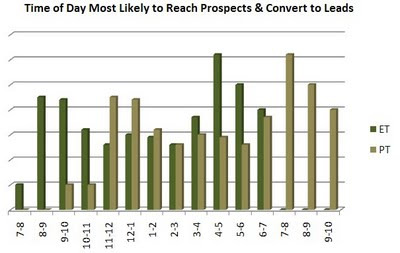 Gerhard Gschwandtner of Selling Power just highlighted last year's MIT / InsideSales.com study of outbound prospecting lead conversion. The report details such information as the right time of day to call, the best day of the week, how the response time to a lead impacts conversion, etc. It got me thinking. For many reps, unless territory comes into play, lead gen exists in a three-time-zone map. For years we've been able to sort our lists by time zone, but what if we could tune it even further and optimize the effectiveness our day using the MIT stats? Layer the times together and stagger them for time zone. Due to the East coast and West coast being predominant in our targeting, we tend to call 40% ET, 40% PT, and 20% CT/MT, so to simplify the discussion, I've just shown ET and PT. The timeline at the bottom is on Eastern time. For strategic planning purposes, this justifies bi-coastal teams. It also suggests a shift in activity during the day. Make the prime times the power-dial sessions, and make the lulls the time where research and other non-dialing activity is completed. So the next time you run late returning from lunch, show this report to your boss and keep dialing.